The Pharisees among the teachers of the Jews in the days when He was here would not accept Him as the Messiah and they asked Him for a proof. They asked Him for a supernatural proof and evidence that He was the Messiah. And so Jesus Christ Himself gave evidence that He was the Messiah and I wonder if you know that evidence was. And I wonder if anyone would ask you how you could prove that Jesus Christ was the very Son of God, the Messiah that was promised to come, could you prove it and how? And I wonder if you realize that practically every organized church and denomination in the whole world even though they profess Jesus Christ deny the sole and only evidence and proof that He gave to prove that He was the Messiah. And why is it that you have not heard what He did preach? Why is it you have heard a message about Him but not very much of what He said? Just about Him but not what He said, not His message. Why have you not heard it? And in going through it we've come up here to Matthew twelve, the twenty-second verse. Do you have a Bible? Run and get it right now wherever you are about the house won't you and open your Bible and see what you see. You're going to see something you didn't know was there. You're going to see something that will astonish you and you'll see it in your own Bible. Don't take my word, read it. See it for yourself in your own Bible. Matthew twelve, beginning with verse twenty-two: "Then was brought unto Jesus one possessed with a demon..." or as the margin will give you — "a demoniac". Actually, one possessed with a demon, blind and dumb. Now, in this case he was made blind and also dumb so he was unable to speak, by a demon. Now, some people who have demons in them and even more than one demon, are not dumb, they talk a great deal. They may be dumb in the sense that the word is used in a slang expression, meaning rather stupid, they don't know very much, but they actually are not dumb in the literal sense. They speak and it is the demon speaking through them. I remember one one time that I was called into see, a woman possessed with many demons. It was just about my first experience in meeting demons. And this woman would start out saying something, jabbering away, and then in the middle of a sentence and without stopping at all, her voice would go on but entirely different words talking about something else altogether. And then she would interrupt herself in the middle of a sentence and start talking about something else altogether, actually the demons in her. Now, let's stop right here just a minute. A lot of people don't believe there is any such thing as a demon. Well, these things happen. You know one of my little grandchildren, one time, I held up a book and I said, "Now, do you see anything between this book and the floor, anything that would pull it down if I let it loose of it, if I quit holding it and pushing up. I'm pushing up against this book so it won't drop. And if I quit pushing, and take my hand away, something's going to pull it down to the floor. See if you can see what's going to pull it down." Well, he couldn't. You just can't see it. Demons are beings who have knowledge and who are invisible to human eyes and demons can actually get inside of people and a great many people in insane asylums are merely human beings that have let a demon get possession of them and these demons possess their minds. That may sound whacky to a lot of people that just don't know about these things but there are a good many things, my friends, that are hidden from men that they don't know. But there are some mysteries that are explained and revealed by the Eternal God. There are things that man cannot know except God reveal them. For instance, just what are you? Some people think you are an immortal soul inside of a body of flesh. Other people think you are just this fleshly body. Other people think you are something else. There are a lot of ideas. Do you any scientist that can prove it? Do you know any scientist that can actually tell you what you are and be sure of it? I don't. Why are you here and how did you come to be here and for what purpose? If you can't know the answer as revealed from God, you cannot know the answer. What are the laws that'll make for peace, for health, for happiness, for joy, for a full abundant life? Except you find them revealed from God Almighty, I tell you, that no scientist in his laboratory, no philosopher, no man can tell you. These are those intangible things that rule our lives and are so very important and yet they're invisible and knowledge of these things is knowledge that cannot come to the human mind through any natural process. There are things that are invisible and things you can't hear, see, taste or smell, and yet the only way that knowledge that can come into your mind naturally as I have said time and time again and as I shall continue to say time and time again, is through the five channels of the five senses. And unless we can realize that there is additional knowledge that is revealed from God, you cannot know. Now, we realize there is such a thing as gravity because we see what it does, we see the effect of it and we know its power but you can't see it and you can't taste it and you can't feel it, and of course, we can't see demons. Well, they exist. Two days later after I saw this woman... No, as a matter of fact, it was the very next day, after I saw this woman, she was perfectly normal. I think it was the very next morning after I saw her and was called in to cast out that demon she was taken to the insane asylum at Salem, Oregon. When she arrived up there, they examined her and they said, "What'd you bring this woman up here for?" They said, "She's not insane, she's in her right mind, she's perfectly rational and normal." There was nothing wrong with her. They sent her back home. The day before, she was a raving maniac. She picked up a flat iron she had concealed in her bed and raised it, tried to throw it at my head. I quickly pointed a finger at her and commanded her to hold it and her hand stayed rigid, she couldn't move it. And when I cast the demons out, well anyway, the next morning, when they got her to the insane asylum at Salem, Oregon, she was a normal woman, once again and she had not been normal for a great many years. Now, here was one brought to Jesus, possessed with a demon, blind and dumb and Jesus healed him, insomuch that the dumb man both spake and saw. As soon as the demon left him he had his natural powers of speech and he was able to see. Now, all blindness is not caused by a demon, let me hasten to remind you of that. My, if something would hit your eye and actually just put your eye out by a physical injury that would not be demon-possession. And all insanity or feeblemindedness or various things of that sort are not demon possession but a great deal many more of them are than very many people realize. "And all the multitudes were amazed and they said, Is this the son of David? But when the Pharisees heard it, they said, This man doth not cast out demons, but by Beelzebub, the prince of demons." Now, Beelzebub is just another name for Satan the devil, who is the former archangel, that is the chief of all the demons. Now, I want you to notice something, Jesus was using the power of God to cast out this demon. Jesus was a begotten Son of God and He came to make it possible for you and me to be begotten sons of God and later to be born of God and enter into the Kingdom of God, just the same as He is in the Kingdom of God. The Kingdom of God is the Divine Family. God is a kingdom. God is not one Person. The Word God as you find it in the very first chapter of Genesis, Elohim in the Hebrew language, means more than one person like the word church, one church and there is only one true Church of God of which Jesus Christ is the Head, the Church that Jesus Christ said, "I will build," when He said, "I will build my church." That Church is one church, not several denominations, not several sects, not several divisions, only one church but, as it plainly tells you in the twelfth chapter of I Corinthians, it is composed of many members. It's like the word body, one body, but composed of many members — ten fingers, ten toes, one nose, two eyes, one mouth and so on. How many hairs on your head? Did you ever try to count them? They're all parts of your body and yet it's only one body, all put together. And so is the Kingdom of God, more than one person. Jesus Christ is one of the Persons that are in the Kingdom of God and the Father is one of the Persons in the Kingdom of God. And there is only the one God or the one Kingdom. God is a Kingdom. It's a God Kingdom. There is the mineral kingdom, the plant kingdom, the animal kingdom, look how many different kind of beings and how many different kinds of life forms are in the animal kingdom, how many in the plant kingdom. And do you know that even in the animal or the plant kingdom, I believe it's true, is it not, now I am not a biologist. I believe it is true that there are more life forms actually in the oceans and under the water than exist on the surface, on the land surface of the earth. I believe that is true. If we have a biologist listening in in our listening audience, he may correct me on that but it seems to me...I know that, anyway, there are a very very great number. Now, I have read the truth on that. I just don't retain those things; whereas, if I were a specialist like a biologist then I would have to retain it. I have know the truth on that point but I just don't retain it. I presume a biologist might learn some of the things in the Bible that I know and he wouldn't retain them perhaps. Well, anyway, they accused Jesus of doing this by the power of the Devil and not by the Power of God, I want you to notice, because they would not accept Him as the Messiah. Now, the whole question was: Is He the Messiah? Is He the Son of God? Did He come with the Power of God? Does He have the very Power of the Kingdom of God which is the supreme ruling Power over all the universe? That was the question. And the Pharisees contested it. Now, a little later they're going to ask Him for proof that He was the Messiah. I want you to notice. But first, they began this way, they said, "This man doesn't cast out demons but by Beelzebub [or by the Devil], the prince of all these demons. And knowing their thoughts, Jesus said unto them, Every kingdom..."
Now, notice He begins to talk about a kingdom here. There is the angel kingdom and there is the demon kingdom and there is the God Kingdom and the human kingdom which is a part of the animal kingdom. "Every kingdom divided against itself is brought to desolation; and every city or house divided against itself shall not stand..." Now, one house but it might constitute many members, one kingdom but many members. God is such a kingdom. Now, notice. "And if Satan casteth out Satan, he is divided against himself...", that is, is speaking of his kingdom. And here Satan is shown to be the head of a certain kingdom. And a kingdom is also a government that rules and Satan is the chief ruler in his kingdom or his government. Now, how is his kingdom going to stand if he operates against himself and tries to cast himself out? "...how then shall his kingdom stand?" asked Jesus. Now, verse twenty-seven, the next verse: "And if I by Beelzebub cast out demons, by whom do your sons cast them out? [They couldn't answer that, of course.] therefore shall they be your judges. But [Now, notice this. But] if I by the Spirit of God..." "If I by the Spirit of God cast out demons, then is the kingdom of God come unto you." He was a member with authority in the Kingdom of God. He was a part of the God Kingdom if He had the Spirit of God because God is a Spirit. God is the great overall creating ruling Spirit Kingdom. God is a Spirit but God is a kingdom and more than one person. And God is the Supreme Government, the Supreme Ruler over all the universe but consists of more than one person. Now, in the God Kingdom, the Father (and the Kingdom of God is also the Family of God) and the Father is the head of that Family, the head of that Kingdom and He is the one who makes the Laws. There is one Law Giver and that is the Father, God the Father, but He has delegated to Jesus Christ to be both the Executive and the Judiciary. If you want to know how to interpret the Bible, if you want to know to how to understand the Bible, understand first, the Bible is the Word of God committed to print and in writing. Jesus Christ is also the Word of God. Jesus is the Word of God. Now, can you understand that. And when He was here, He spoke only as the Father told Him to speak. He was subjective to His Father's Laws. He said, "I have kept my Father's commandments." He spoke only as the Father commanded Him to speak. He was always obedient to the Father. Now, I wonder if you can understand. Jesus is the author of the Bible. And the Bible is merely His written word. Now, the Bible interprets the Bible. The key to the real fundamental big key, the master key, to the understanding of the Book of Revelation is the fact that John is not the Revelator but Jesus Christ is the Revelator. Jesus is the Revealer. He is the one who does the revealing. Now, He doesn't always do it in the Book of Revelation itself. You come to the sixth chapter where we have been and you find there a lot of symbols, four horsemen and later other symbols. What do they mean? You don't find it revealed in the sixth chapter. Well, John is not the Revelator, men are not the Revelators, churches and church denominators are not the Revelators. Don't go to a church denomination and ask them what did He mean, because they won't give you the right answer. They will give you the answer they think is right. You go to another church denomination and they'll give you a different answer. One church denomination says that white horse is Christ at His second Coming. Another will tell you that that white horse is some man that's going to arise now in this day and do certain things. And another will tell you it's something else. Those are human ideas and many men think they get them from God but if you want to get it direct from God go to the Son of God, go to Jesus Christ. He is the one to reveal it. And if there is any revelation other than His, it is false. A man called me on the telephone the other day. He said that God had just revealed to him all of the Book of Revelation the night before. I asked him one question — who was the white horse? He didn't know. He had something that is different than that which Jesus Christ reveals. Therefore this man should have known that the Bible says, "Try the spirits whether they be of God." Perhaps, some spirit was speaking to him, I don't know. Perhaps it was only in his own mind. But something was speaking to that particular man. And again you will find back in Isaiah when they peep and mutter and one thing and another and come to you about things like that. It says to the Law and the Testimony and that is the Word of God, the Bible, "if they speak not according to this word, it is because there is no light in them." This man didn't speak according to that Word. He didn't give me Jesus' interpretation. I have the interpretation of Jesus, it's written in the Bible, it's in plain language, I have the original Greek words as they have been faithfully copied from the many many copies that we have. And therefore we can know and not be in any doubt as to what is the right translation or the right interpretation of what is that white horse because Jesus tells us in plain language. Now, when a man says that, "God has revealed it to me." And he reveals something different than that I find written in the Bible, in the very words of Jesus Christ then I know that man was listening to some false spirit somewhere. He is off. And of course he's so far off he thinks everybody's wrong but him. Well, now listen, Jesus said, "If I by the Spirit of God cast out demons, then is the kingdom of God come unto you." Do you know that the Kingdom of God as it will be set up on this earth will have a king over all of the kings and Jesus Christ is that king? He was born to be a king. And He will come again as the "King of kings and the Lord of lords." Now, if He "by the Spirit of God [the Power of God and the Kingdom is a Spirit] cast out these demons, then the kingdom of God was come nigh to them." But if He by the spirit of Satan cast out demons then it was the kingdom of Satan being divided against itself. But what He did was cast out one of Satan's kingdom. And that is not God's Kingdom divided, that's God's Kingdom casting out Satan and Satan's kingdom and replacing Satan's kingdom and that's what Jesus Christ came to do. And Satan's kingdom will soon end. We're in the generation that will see it end. Now, here in verse thirty-four, "Ye offspring of vipers...", said Jesus to these Pharisees. Notice, He was talking about the Kingdom of God and the fact that He was the Chief, the Prince of that Kingdom, and that He had power and authority from God, the Power and Authority of the Kingdom of God. Then He said to them, "You offspring of vipers..." You know, I'll bet they said, "Oh, he's calling names. Why He's... What is He? Calling names." Yes, Jesus Christ called them names; said, "You offspring of vipers..." Vipers are serpents and serpents are, they are a type of the Devil. And so, He was accusing them of being the children of the Devil, that's all. "You are the children of the Devil." That's what He was telling them. "How can you, being evil, speak good things? for out of the abundance of the heart the mouth speaketh." "Out of the abundance of the heart the mouth speaketh..." That's a little sentence in your Bible, it's just part of a sentence actually that should be underscored, underscore it in red. That's something to refer to now and then and just remember. Then He said, "And I say unto you, that every idle word that men shall speak, they shall give account thereof in the Day of Judgment. For by thy words thou shalt be justified, and by thy words thou shalt be condemned." You know what James says about the mouth, the tongue as he mentions it, the speaking part of the mouth. It's a very little part of the body, a small member but he says it's a very unruly one and one you'll have a hard time controlling showing that we are suppose to control our own selves, our own minds, our own bodies, every part of us, even the tongue and watch what we say. Now, then these Pharisees came back at Jesus with another question. Then, verse thirty-eight, "...certain of the scribes and the Pharisees answered him, saying, Master, we would see a sign from thee." Now, in Bible language, my friends, a sign is a miracle proving an identity. In other words, what they meant is, "Give us a miraculous proof that you are the Son of God, that you are the Messiah." In other words, they said, "You have claimed that you cast out these demons by the Spirit of God. You have claimed you're the emissary of the Kingdom of God, that you are God's Ambassador, that you carry the authority of the Kingdom of God. And by the authority vested in you from the Kingdom of God which is the ruling Kingdom higher than the Kingdom of demons, that you can cast out a demon out of a human being and force that demon to leave the human being. Now, that's what you claim but we don't believe it." That's what the Pharisees in effect were saying. They said, "If you are the Messiah, you give us some proof." Now, Jesus had just given them proof by His Power to cast out the demon but they denied it. They thought Satan could furnish that power. Now, they wanted a proof that could not be denied and they wanted a proof, by a miracle that Jesus was the Messiah. How did Jesus prove He was the Messiah? Here, my friends, is the one and only evidence or supernatural miraculous proof that Jesus Christ ever gave to lay claim to being your Savior and mine. If you deny this, how can you accept Him as Savior? "He answered and said unto them, An evil and adulterous generation seeketh after a sign..." In the Bible you speak of signs and lying wonders and miracles. Always signs are related to miracles but a sign is something that identifies. And this was a miracle that would identify God as the Savior, as the Messiah, as the Divine Son of God as the One having this Power from God that He claimed. Notice, now. "An evil and adulterous generation seeketh after a sign," answered Jesus, "and there shall no sign be given to it, but [now, just one] the sign of Jonah the prophet." Oh, have men been laughing at the Book of Jonah. They talk about Jonah swallowing the whale. They make a great joke out of it. Do you know why? Here, my friends, is the only divine supernatural evidence that Jesus gave to lay claim to being the Messiah, the Savior of the world. And the Devil will put it in the mind and the heart of men to sneer at that and to ridicule it just like they sneered at Jesus, ridiculed and rejected Him. And the Devil will put it in the hearts of men and of churches of men and denominations of men to reject this sign thereby rejecting their Savior though in the same breath they profess Him. Listen, my friends, get your eyes opened. 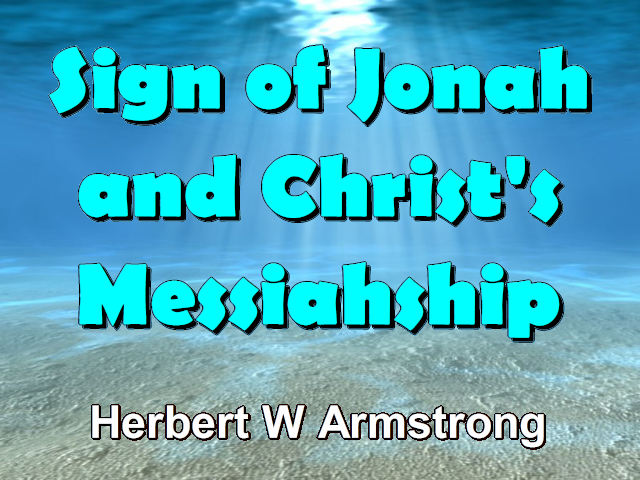 "There shall be no sign given that I am the Messiah [that's what He was proving] but the sign of Jonah the prophet. For [now, here it is] as Jonah was three days and three nights in the belly of the..." Now, whale is a wrong translation in the King James. Actually, great fish or sea monster is the right translation. The Greek word is...should be translated that and in the Book of Jonah, "God had prepared a great fish..." It was not necessarily a whale. That is one mistake. Three days..."Jonah was three days and three nights in the belly of the great fish, so [as Jonah was there, so] shall the Son of man be three days and three nights in the heart of the earth." Now, let's turn back to Jonah just a second. And in the first chapter of Jonah the last verse, the seventeenth, we read this: "Now the Eternal had prepared a great fish to swallow up Jonah..."
Jonah had been given a mission to perform. But Jonah was human. Jonah was a type of Christ the Messiah. But he was human and Christ is Divine, there was a great difference. Jonah, started out to disobey. Jonah thought that by getting on a ship and traveling away, he could get away from the command of God. God had commanded him to go to Nineveh and warn Nineveh a Gentile city what was going to happen to them. Jonah didn't want to do it. Jonah got on a ship. God caused things to happen so that the sailors on the ship had him thrown overboard. And when he was thrown overboard, it says here, that "the Eternal had prepared a great fish to swallow up Jonah. And Jonah was in the belly of the fish three days and three nights." Can you get anything less that seventy-two hours out of that? "Then Jonah..." continuing, chapter two, "Then Jonah prayed unto the Eternal his God out of the fish's belly, and he said, I cried by reason of mine affliction unto the Eternal, and he heard me; out of the belly of [the Hebrew word is sheol and that is the grave, out of the belly of the grave, G-R-A-V-E, a place where they bury people] cried I..." Hell, is a wrong translation there, my friends, it should be grave. The original Hebrew word was sheol. "Out of the belly of the [grave] cried I, and thou heardest my voice." And then after three days and three nights, God caused him to be supernaturally resurrected. The whale or the fish vomited him up after which he as the mortal, human type of Jesus went to this Gentile city of Nineveh and warned the people and became the Savior of the people of Nineveh because they did heed the warning. And in like manner, Jesus Christ was in the grave in the heart of the earth in the rock-hewn tomb, three days and three nights, after which God supernaturally resurrected Him to become the Savior of the world for all who will heed the warning. My friends, the resurrection of Jesus Christ was not on Sunday. If He was buried on Friday night and rose Sunday morning, can you get three days and three nights out of it, try to figure it. The resurrection was not on Sunday, the crucifixion was not on any "Good Friday." If you want the truth, write for our free booklet, on the Resurrection. There's no charge for our free booklet on the truth about the day of the Resurrection. Just write for the word Resurrection, we'll know what you mean. Now, just first write down the call letters of the station to which you're listening and send your request. There's no charge. So, until tomorrow, goodbye friends.